Use this report to gain insights into the effectiveness of your current vulnerability management, learn about new vulnerabilities and emerging threats, help prioritize your efforts, and focus on specific areas in your environment. This report is composed of three pages, Vulnerability Summary page, Top 10 Lists page, and the Vulnerability List page. To see the Top 10 Lists page, click the arrow icon ( ) on the top right of the Vulnerability Summary page. To see the Vulnerability List page, click the arrow icon ( ) on the top right of the Top 10 Lists page. Click Vulnerabilities Analysis, and then click Vulnerabilities Summary. To refine your findings, filter your report by Date Range, Customer Account, Deployment Name, and Asset Tags. This section provides the total number of vulnerabilities found, new vulnerabilities seen for the first time, and fixed vulnerabilities not seen during the last scan in the selected period. To see a specific list of vulnerabilities, double-click on the Total number headline, and then click List these vulnerabilities. This section provides the total number of hosts with vulnerabilities in the selected filters. The line graph presents the monthly trend of the total number of vulnerabilities from the last four months. To see a specific list of vulnerabilities, click on the graph line above the date you want to see, and then click List these vulnerabilities. 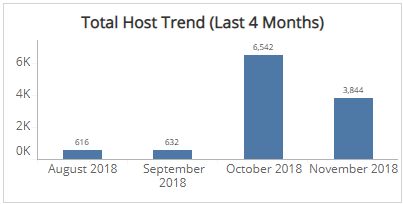 The bar graph presents the trend of the total hosts from the last four months. The size of the circles represent the total vulnerabilities in each age category while its color represent the severity category of those vulnerabilities. To see a specific list of vulnerabilities, click on a circle, severity category, age category, or number, and then click List these vulnerabilities. You also have the option to set additional filters on the Vulnerability Summary page when you click one or more circles in this section. This section provides the distribution of CVSS severity categories and trend of vulnerabilities over the selected time period in the selected filters. To see a specific list of vulnerabilities, click on a slice in the pie chart, a severity category, or an item in the graph, and then click List these vulnerabilities. You can also have the option to set additional filters on the Vulnerability Summary page when you click a slice in the pie chart. You can display the trend data as a line or bar chart. Click the drop-down on the top right of this section, and select the chart type you want to see. To see a specific list of vulnerabilities, click on a pie chart age category, an age category, or an item in the graph, and then click List these vulnerabilities. You also have the option to set additional filters on the Vulnerability Summary page when you click a slice in the pie chart. You can display the trend data as a line or bar chart. 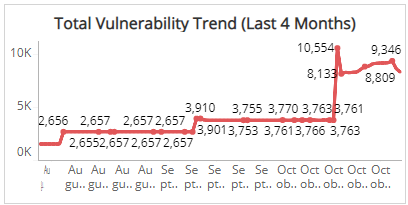 Click the drop-down on the top right of Vulnerability Severity Distribution and Trends section, and then select the chart type you want to see. These sections provide top 10 lists of your most vulnerable hosts by total count and by severity, oldest critical vulnerabilities, and frequent vulnerabilities. To see a specific list of vulnerabilities, click on an item in the chart, and then click List these vulnerabilities. The list displays the 10 most vulnerable hosts based on the total vulnerability count during the selected period. The list is organized by customer account, host name, distinctive vulnerabilities, and the percentage of those vulnerabilities, along with a color-coded bar that represents the size of the vulnerabilityies count. Click on any item in the chart to see a specific list of vulnerabilities. 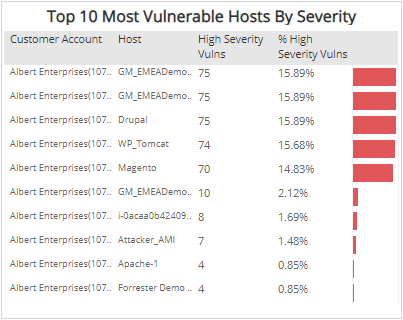 The list displays the 10 most vulnerable hosts based on the high severity vulnerability count during the selected period. The list is organized by the customer account, host name, count of high severity vulnerabilities, and the percentage of the high severity vulnerabilities, along with a color-coded bar that represents the amount of high severity vulnerabilities. The list displays the 10 oldest critical vulnerabilities based on their age and severity during the selected period. The list is organized by the customer account, host name, CVE, vulnerability name, maximum age, and CVSS score. 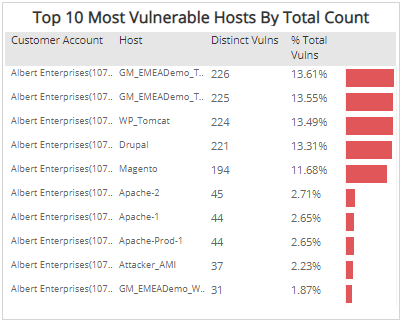 The list displays the 10 most frequent vulnerabilities based on the distinct number of vulnerability instances and impacted hosts during the selected period. The list is organized by CVE, vulnerability name, distinct vulnerabilities, distinct hosts, and the percentage of the total vulnerabilities. To see the Vulnerability List page, click the arrow icon ( ) on the top right of the Top 10 Lists page. The vulnerability list displays all vulnerability instances found in the selected filters. The list is organized by the date created, customer account, deployment name, host name, CVE, vulnerability name, vulnerability severity, maximum age, and CVSS score.